Harry Houdini Biography: The most famous magician of all time. Actual name of Magician Harry Houdini. Ehrich Weiss was Magician Harry Houdini's actual name. Magician Harry Houdini's actual birthplace and date. The Magician known world wide as Harry Houdini was born on March 24, 1874 in Budapest (not in Appleton as claimed by people there) and died in Detroit in 1926. After his death his wife held seances as a test, to no avail. Magician Harry Houdini often claimed by many to be born in Appleton, Wisconsin, actually came to the United States when he was four years old. To this day many connected with the small town of Appleton still claim in their biography of Magician Harry Houdini that he was born there, to attract tourists. It is clear from Magician Harry Houdini birth records and early family records located at the Harry Houdini Museum in Scranton, Pennsylvania in the Pocono region, that Magician Harry Houdini was in actually born in Budapest, on March 24, 1874. Historians are agreed on this fact. In later years, in a magazine interview, Magician Harry Houdini said about Appleton, "the greatest escape I ever made was when I left Appleton, Wisconsin." Biography of the early years of Magician Harry Houdini. Magician Harry Houdini's father was Mayer Samuel Weiss. Magician Harry Houdini's father was a Rabbi. His father for a short time was Rabbi for the German Zoin Jewish Congregation in Appleton. His mother's name was Cecilia Steiner Weiss. 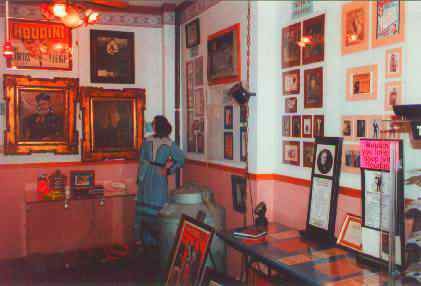 Magician Harry Houdini's original family pictures are on display at the Houdini Museum in Scranton, Pennsylvania in the Pocono region. Later as a star performer throughout the world Houdini would form an organization called "The Sons of Rabbis." Besides those listed I believe George Gershwin and Irving Berlin we also members. The Howard Brothers were famous comedians in vaudeville. Willie and Eugene Howard. This ad was supplied to us by Tom Klem, a historian, supperter and friend. Yiddish, Hungarian, and German were the only languages spoken by Magician Harry Houdini's parents. Magician Harry Houdini's family was quite poor so most of the children began to work at an early age. From the age of eight young Ehrich Weiss (Erik Weisz) sold newspapers and worked as a shoe shine boy. Please note that when coming ot the United States there were often many spellings of names as people adjusted to English. At the age of 12, young Ehrich left home to make his way in the world in an attempt to help support his family. This was a great sign of independance. This is contrary to some biography books that incorrectly claim that Magician Harry Houdini was overly obsessed with his mother. Magician Harry Houdini did love her very much, however. Magician Harry Houdini moves to New York City at the age of 13. Young Ehrich left Appleton and traveled the country for about a year, always sending money home when he could. Finally he joined up with his father, who left Appleton, in New York City. His father would die about five years later on October 5, 1892 never to see his magician son's gret success. The move to New York from Appleton would change Magician Harry Houdini's life and introduce him to the world of big time magic. The family moved from Appleton to New York in the the hope of finding a better life there. In New York, Magician Harry Houdini worked as a messenger and as a cutter in a garment center sweat shop, Richter & Sons, a tie factory to help support his family. He was very athletic and won awards in swimming and track. He would use this athletic and swimming talents to great use in his future as an escape artist. Magician Harry Houdini Biography 1913 - 1926 and beyond. Go to <> Houdini Museum . © 2009 - by magicusa. Except for reviews, no part of any of this document may be reproduced in any form, without written permission by the authors. The graphics have been retouched, computer enhanced and resized by the authors.